This article is about the Kraftwerk live album. For that band's box set, see The Catalogue. 3-D The Catalogue (German: 3-D Der Katalog) is the second official live album by German electronic music band Kraftwerk. It was released on 26 May 2017 and was released on several formats, including a four-disc Blu-ray box set, an eight-disc CD box set and a nine-disc vinyl box set. According to the liner notes, the album documents Kraftwerk's 1 2 3 4 5 6 7 8 tour at various museums and concert halls around the world: Museum of Modern Art in New York City (9–17 April 2012), Kunstsammlung Nordrhein-Westfalen in Düsseldorf (11–20 January 2013), Tate Modern in London (6–14 February 2013), Akasaka Blitz in Tokyo (8–16 May 2013), Sydney Opera House (24–27 May 2013), Walt Disney Concert Hall in Los Angeles (18–21 March 2014), Burgtheater in Vienna (15–18 May 2014), Fondation Louis Vuitton in Paris (6–14 November 2014), Neue Nationalgalerie in Berlin (6-13 January 2015), Paradiso in Amsterdam (16–23 January 2015), DR Koncerthuset in Copenhagen (26 February – 1 March 2015), Oslo Opera House (4–7 August 2016), and Guggenheim Museum Bilbao (7–14 October 2016). Disc seven of the set is mixed in Headphone Surround 3D. Unlike on most live albums (including Kraftwerk's own Minimum-Maximum), there is no audible crowd noise. The album was nominated for two awards at the 60th Grammy Awards, Best Dance/Electronic Album and Best Surround Sound Album, winning the former. ^ Simpson, Paul. "Kraftwerk - 3-D: The Catalogue". AllMusic. Retrieved 23 June 2017. ^ Gill, Andy. "Album reviews: The Unthanks - The Songs And Poems Of Molly Drake, The Charlatans - Different Days, and more". The Independent. Retrieved 24 May 2017. ^ Easlea, Daryl. "KRAFTWERK - KRAFTWERK – 3-D THE CATALOGUE". Record Collector. Retrieved 1 July 2017. ^ Muggs, Joe. "Kraftwerk - 3-D The Catalogue". Resident Advisor. Retrieved 9 June 2017. ^ Dalton, Stephen. "Kraftwerk – 3D The Catalogue". Uncut. Retrieved 26 May 2017. ^ "Kraftwerk Announce 3D Concert Film, Live Album". Spin. 21 April 2017. Retrieved 26 May 2017. ^ "Kraftwerk Announce Massive '3-D The Catalogue' Live Box Set". Rolling Stone. 21 April 2017. Retrieved 30 May 2017. ^ "Austriancharts.at – Kraftwerk – 3-D - Der Katalog" (in German). Hung Medien. Retrieved 8 June 2017. ^ "Ultratop.be – Kraftwerk – 3-D - The Catalogue" (in Dutch). Hung Medien. Retrieved 3 June 2017. ^ "Ultratop.be – Kraftwerk – 3-D - The Catalogue" (in French). Hung Medien. Retrieved 3 June 2017. ^ "Top Stranih [Top Foreign]" (in Croatian). Top Foreign Albums. Hrvatska diskografska udruga. Retrieved 29 January 2018. ^ "Dutchcharts.nl – Kraftwerk – 3-D - The Catalogue" (in Dutch). Hung Medien. Retrieved 3 June 2017. 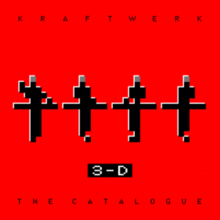 ^ "Lescharts.com – Kraftwerk – 3-D - The Catalogue". Hung Medien. Retrieved 3 Juny 2017. ^ "Offiziellecharts.de – Kraftwerk – 3-D - Der Katalog" (in German). GfK Entertainment Charts. Retrieved 6 June 2017. ^ "Top 40 album DVD és válogatáslemez-lista – 2017. 22. hét" (in Hungarian). MAHASZ. Retrieved 9 June 2017. ^ "Italiancharts.com – Kraftwerk – 3-D - The Catalogue". Hung Medien. Retrieved 29 January 2018. ^ "Official Scottish Albums Chart Top 100". Official Charts Company. Retrieved 3 June 2017. ^ "Swisscharts.com – Kraftwerk – 3-D - Der Katalog". Hung Medien. Retrieved 7 June 2017. ^ "Kraftwerk | Artist | Official Charts". UK Albums Chart. Retrieved 3 June 2017. ^ "Top 100 Album-Jahrescharts – 2017". GfK Entertainment (in German). Retrieved 29 December 2017.